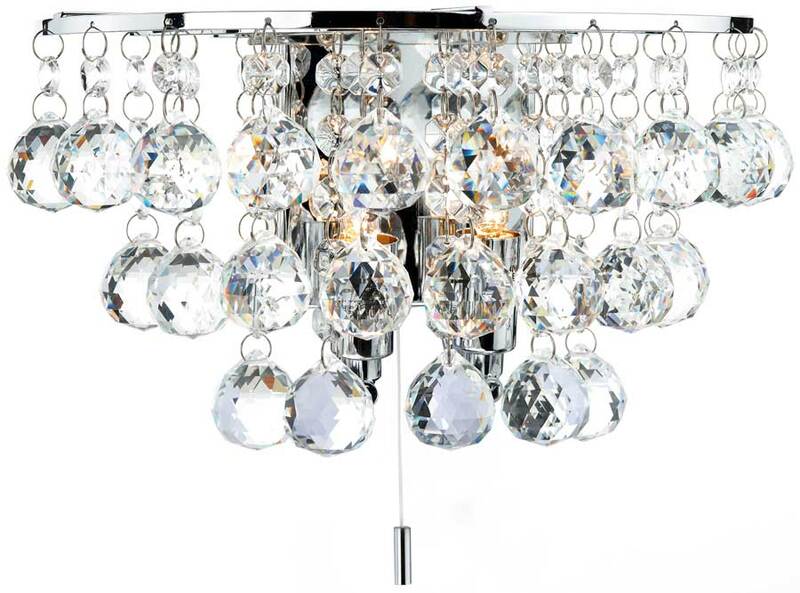 The Dar Pluto 2 lamp switched crystal wall light in polished chrome is highly decorative, with a square wall mount and half-round polished chrome frame dressed with masses of heavy faceted crystal balls to add sparkle. This contemporary light fitting is easily operated by the lower mounted on / off pull switch and the bright halogen bulbs (not supplied) bring out the best in the design. Other products in the chrome Pluto range can be viewed below and include three various sized flush fitting ceiling lights and a matching finish switched wall light. A class 2, double insulated product, no earth required. Supplied fully assembled for easy installation. Please click here for installation instructions. Hi. I wonder if you would be able to tell me what the pull switch is made of please? Is it metal or material? Thank you for your enquiry, the PLU0950 wall light has a cord material pull cord with a metal end.